The Greek Chapel of St John the Theologian contains a unique history that will capture the hearts of all who visit. Walk around the church that was generously built by Geoff Edwards OAM, a local resident of Margaret River who fought in the Battle of Crete in World War II. Grateful for the kindness of the Cretans and the friendships that developed, Edwards built the church as a tribute to the Greek people who helped him and his fellow troops. The Greek architecture of the place of worship looks surprisingly at home in the rural town of Margaret River. Wander around the church and learn about the number of generous acts of Edwards. Take note of the use of Unit Colour Patches that have been affixed to much of the furniture and fittings throughout the church as a commemoration to the servicemen. 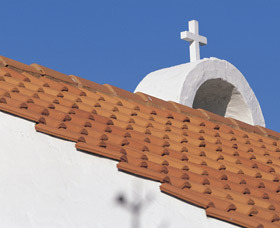 Located in the charming town of Margaret River, a visit to the Greek Chapel of St John is a heart warming experience. Allow time to explore the hub of the winery region. Margaret River is a three and a half hour drive south of Perth.